Brahmapur (earlier known as Berhampur) is one of the major cities in the Ganjam district of Odisha. As the coastal city is to the South of Odisha, you see cultural assimilation in this city. Maa Budhi Thakurani is the famous local deity and the temple is located near the crowded 'bodo bazaar' i.e big bazaar area of old city. The word 'budhi' means old or older in local language (Oriya). There is another temple of 'Sano Thakurani' who is considered younger to the main deity, hence this main deity is known as 'Budhi Thakurani' which the younger 'Thakurani' is known as 'Sano Thakurami' . In Oriya language, the word 'sano' means younger and 'thakurani' means goddess. The local Telugu people call the deities as 'Pedda Ammavaru' for Budhi Thakurani and 'Chinna Ammavaru' for the younger goddess temple. It is only the face of the idol of Budhi Thakurani which is seen prominently inside the sanctum sanctorum. The face of carved of hard stone and is completely smeared with red color vermilion (sindoor). Though there is no historical evidence, yet it is believed that the celebration of Jatra dates back to the 17th century when the professional weaver community (known as Devangulu plural word in Telugu) were invited by the then Raja Saheb of Mahuri to take up the profession of silk weaving in the then Ganjam region. Thus a group of people of the Dera (Devanga) community lead by their chief migrated to to Ganjam region and started weaving of silk which eventually became famous as Berhampur Silk (pattu). As per their custom, the migrated weaver community started the 'Ghata Festival' (procession carrying sacred pot on the head). Legends say that Desi Behera - the head of the Devanga Community of the region - used to daily worship Maa Budhi Thakurani with flowers. Once while traveling through woods, he saw a young girl weeping on the roadside. On inquiring, he came to know that She lost the way while traveling along with her father. Being a kind man, Desi Behera invited the young girl to his house with a fatherly feeling. The young girl accepted his invitation but to his surprise She walked into the nearby bushes and disappeared. As usual Desi Behera went to the temple to worship Maa Budhi Thakurani. When he worshiped the goddess by offering flowers, the goddess didn't accept his offerings. He then heard a Divine voice which said, "you have invited me to your home with a fatherly feeling, hence I don't want to get worshiped by my father". She further said that She will come to stay at Her father's place for nearly a month, once in two years. 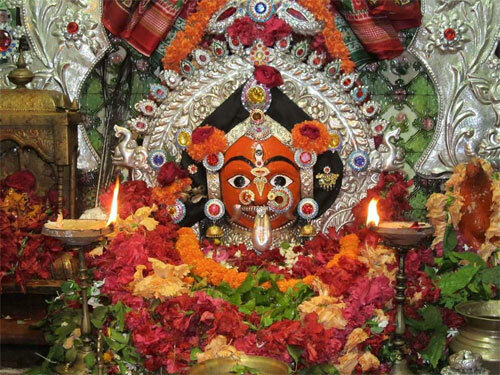 Thus, started the unique festival of Thakurani Jatra to commemorate the visit of the local deity Maa Thakurani to Her parent's home at Desi Behara Street in Berhampur once in every two years. 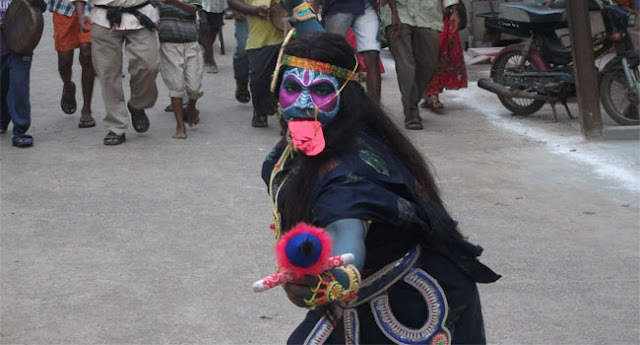 Thakurani Yatra (known as Jatra in Oriya) is one of the unique festivals of Odisha. It is one of the biggest festivals of South Odisha which is celebrated with much gaiety. According to historians, the preparations for the nearly month long festival start from Mahasivaratri day. The festival is celebrated in the Hindu month of Chaitra. The Jatra is organized by the hereditary head of the Desi Behera family who is the Chief Organizer of the festival. He visits the temples of 'Sano' and 'Budhi Thakurani' and invites the deities to his home. He then takes the sacred pole known as 'shubha khunti' in a procession and erects it in front of his house which marks the beginning of the Jatra. The next morning i.e. on the 1st day of the Jatra, the Chief Organizer and his wife visit the temple and perform floral offerings to the goddess. A garland made of special type of local flowers called 'ita malli' (local jasmine flowers) is placed inside a decorated earthen pot (i.e ghatam). This earthen pot along with 8 such decorated pots represent 'thakurani' and ashta devatas (i.e 8 goddesses). These ghatams are taken in a grand procession called ghata parikrama which is the most important event of the jatra. The main ghatam is carried by the wife of the Chief Organizer on her head while the 8 other ghatams are carried by the women on their heads and are placed in a thatched house in Desibehera street. This place is considered as temporary abode of the goddess during the jatra. After a month long jatra, these ghatams are taken in a grand procession back to temple on the last day of the festival. During the month long jatra, the entire city of Brahmapur gets a colorful look with a carnival spirit. The city does not sleep during the nights and is involved in festival celebrations. The main attraction of the jatra is the dressing up of the locals dressed in different styles (called 'besho' in Oriya). The most important one is the tiger dance which has become an integral part of the jatra. The dancers paint their entire body with black and yellow stripes with varnish and cover their face with tiger mask. 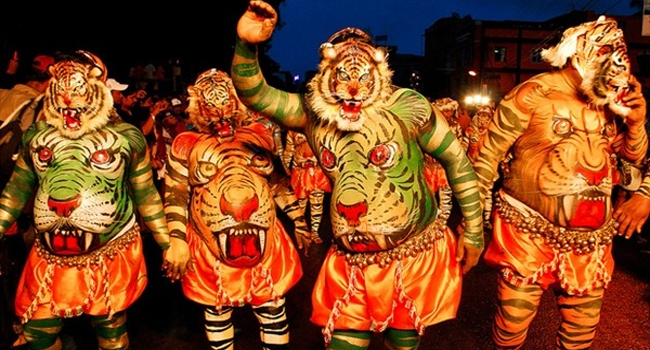 These dancers give a ferocious tiger appearance and dance to the rhythmic beats of the local drums (called dappu). This is known as 'puli vesham' in Telugu language which is famous in Andhra Pradesh. Originally people who take a vow (manokamna), used to perform this dance. But presently, this has become a profession and is performed as a cultural show during the jatra. I got the opportunity of seeing 'Puli Vesham' i.e. the tiger dance during my childhood when I was in Berhampur (Gm) for sometime. Besides this 'puli vesha gallu' i.e people in tiger costumes, people (both young and old) dress up in different mythological costumes like Hanuman, Krishna, Radha, Rama etc. These people keep moving from one house to the other and keep collecting money which they offer to 'Thakurani'. The other interesting character dress up that keeps moving in the jatra is the 'pilakhai dhayani'. The person dresses up in full black costume with a red protruding tongue and with a small celluloid doll in one of his hands. The literal meaning of 'pilakhai dhayani' is the monster who kills and eats children. Few other interesting characters include 'butta bommalu'. The dancers wear huge basket like hollow masks of different mythological figures. These hollow figures are made of eco-friendly material mostly of bamboo and are interwoven like a basket. In this way, once their wish is fulfilled, the local people dress up themselves in different characters during the month long jatra and show their gratitude to goddess. However, these days people even dress for fun during the jatra. During the festive period, the entire city takes a new look with festive fervor. The local people worship 'Thakurani' with much devotion and belief. The jatra culminates with the return procession of the 'ghatams' that are taken back to the temple. 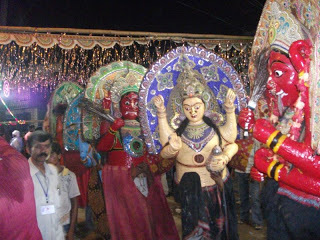 On the whole, this is a unique festival of Berhampur, Odisha and is one of the state festivals of Odisha. 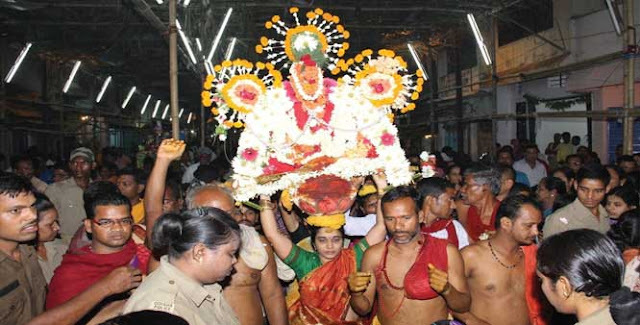 Maa Budhi Thakurani Jatra that is celebrated once in two years in Berhampur is worth a watch.